10 For God is the one who gives seed to the farmer and then bread to eat. In the same way, he will give you many opportunities to do good, and he will produce a great harvest of generosity  in you. I have set this scene in the afternoon. The sun is positioned to the right (west) of this scene, casting the shadows to the left. The phrase “a farmer who plants only a few seeds will get a small crop” really struck me this morning as I read the Bible. I decided to produce this cartoon based on that principle. I decided to include a Cape Hare, sitting next to the farmers crops, just to add interest. 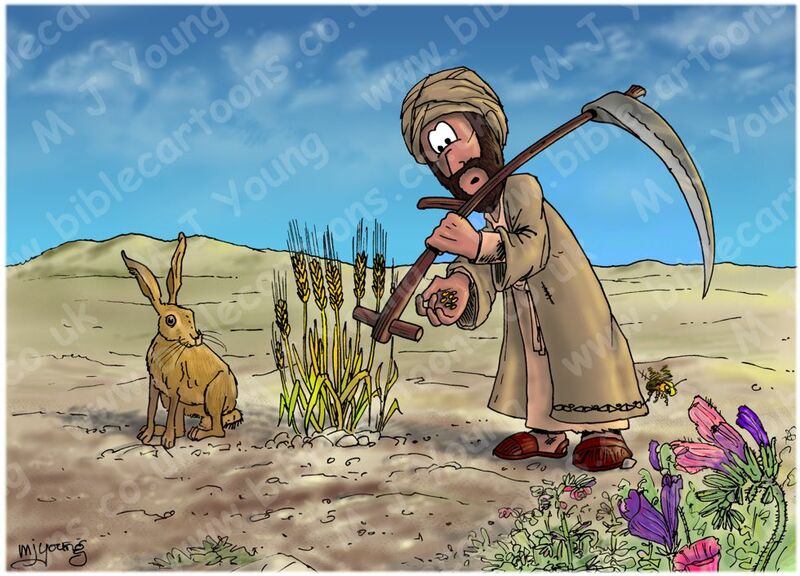 The Hare hasn’t eaten the farmers crops – it is merely looking at the meagre pickings! Google Earth position & orientation: 32° 39’ 45.25“N 35° 17’ 55.45“E Looking SSE. The Jezreel plain, also referred to as HaEmeq (the Valley), is in northern Israel. It extends from the Mediterranean sea in the west, southeastward to the Jordan valley, between the upland regions of Samaria and Galilee. The Old Testament name is the plain of Esdraelon. Behind you (the viewer) is Nazareth, where Jesus spent most of his life. On its southwestern slope the Philistines assembled to fight Saul (the first king of the Hebrews): “So the Philistines gathered together and came and camped in Shunem (a town); and Saul gathered all Israel together and they camped in Gilboa (I Samuel 28:4). Gideon (and his three hundred man army) defeated the Midianites here as well: “Then Jerubbaal (that is, Gideon) and all the people who were with him, rose early and camped beside the spring of Harod; and the camp of Midian was on the north side of them by the hill of Moreh in the valley” (Judges 7:1). 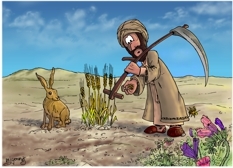 The farmers’ problem is not the soil (or the Hare!) but his own stinginess with the seed! Photographs of this area show fields of dark brown soil, with lighter chalk or limestone throughout. This colouration I have adopted in my cartoon. According to geological maps Nazareth is situated on the Mount Scopus Group (Chalk, marl) ranges in thickness from 0–1,640 feet (0–500 metres), it averages about 984 ft (300 metres) thick. It predominantly consists of biomicritic, bituminous, poorly-bedded, white foraminiferal chalk, which forms a characteristic landscape of soft hills. Hard calcareous chalks, biorudites and detrital sandy limestones usually occur at the base, and soft white marly chalks and shales terminate the sequence. Flint is abundant, and occurs as massive brecciated brown cliffs or thin continuous or nodular layers. 1) Hills of this chalk material form a “characteristic landscape of soft hills” rather than steep-sided cliff edged hills. This is why I have drawn rounded low hills in my cartoon. The Givat-Hamoreh hill on the horizon appears to be composed of Limestone (according to the geological map.) The Jezreel plain is the largest valey in Israel and a very fertile region, hence I have situated my little agricultural scene here.